Tired of New Year, Same Ol’? According to the internets (the one Al Gore invented, though it must have actually been the spawn of Donald’s brilliance, but I digress), 75% of all New Year’s Resolutions fail by the end of the January. How are yours going? Read on for some tips to re-energize your goals and smash that abysmal failure rate. You have probably heard the quote by Benjamin Franklin, “If you fail to plan, you are planning to fail.” A great goal starts with a great plan. Playing it by ear just doesn’t work. When I work with my clients, we start with a vision. Just as vision is one our senses, envisioning life at a future time is really a sense about how your life will look. A vision has looser boundaries than a goal because as goals are formed and then attained, your perspective on the future expands and changes. Vision is held loosely while goals are held more tightly, especially those presently in process. When you know your values and have a strong and resonating vision, goals are easily developed and prioritized. When setting goals, it is important to first consider where you are now in relation to where you wish to be. If you don’t feel a bit of trepidation about the undertaking, perhaps the goal is not so much a goal rather than a slight extension of what you are doing now. Stepping a bit out of your comfort zone is necessary to making real personal growth. Russian psychologist, Lev Vygotsky developed the concept of Zone of Proximal Development (ZPD), which is the difference between what one can do on their own and what they can do with support. Working in one’s ZPD maximizes growth potential and guards against becoming stuck in the loop of only reinforcing that which is already known and moving learners to new and deeper understandings. Any good personal growth plan requires a process for scaffolding or putting into place support structures (tools, coaches, mentors, teachers) as long as needed before building new scaffolds further along in the growth curve. Get clarity on your personal values and vision. Reserve your complimentary coaching consultation now! You should be able to specifically describe your goals. Think about who, what, where, why, when, and how when you Relating to the concept of stretching you out of your comfort zone, the specificity also points to significance in your personal growth journey. Is this goal significant to moving the proverbial boat forward or is it just busy work. This may seem like a no-brainer idea. Of course we’d choose a goal that meaningful…but sometimes we attach meaning to things that seem urgent, but aren’t really important in the long run. In forming goals, expounding a bit into the “why” or significance of the goal assures its alignment with your greater vision. Finally, simplicity is key. You may have heard the phrase K.I.S.S. or “keep it simple, stupid”. There is much truth to the idea that complex problems have simple solutions. Attacking problems with too much complexity adds layers and variables that often add more layers and variables that confound the problem. Complex problems are best solved with a series of simple solutions built upon one another. Start with simplicity. My five year vision for my business is to have a practice in which people seeking to make incredible personal growth engage with a variety of content, tools, and professionals across multiple wellness perspectives such as coaching, mentoring, counseling, business consulting, physical wellness and more. People engage both remotely and in person, individually, in groups, and workshops. So to do that I need to set a specific goal right now that will direct me toward that vision. To do that, I will have to grow my practice beyond what I can manage by myself. Since I have done virtually no marketing, so one of my marketing goals is to engage potential clients via my email list. I could talk about social media marketing as well, but I am going to save that as another specific goal so I can put the right tools in place to monitor my progress without diluting the important details of the goal. My goal is this: This year I will grow my email marketing list by 4x through free downloads on the enLiven Wellness Coaching Website, social media posts, and business networking. Ready to set bold goals and challenge yourself to make really impressive personal and growth? Reserve your complimentary coaching consultation now! The greater specificity of goal allows for measurability. If you can’t define where you are now or where you are going, how will you know when you have achieved your goal? Sure you can say, “I’ll just know,” but as life happens, you experience your feelings and emotions differently over time. When thinking about measurability of a goal, it is more important to think about it in terms of how a stranger would know if you reached your goal. If you gave them the measuring stick and never told them where the finish line was, would they know you’ve reached it? I often hear, “My goal is to be successful.” I don’t have a success-o-meter and my definition of success can look very different than yours. What is success to you? Quantify it and then I can tell how far you have come and how far you have to go. This seems like a no-brainer, but this seems to be what people most balk at. I suspect that is because it brings life to the goal and the fear of failure rises to the surface. If your goal is to earn a promotion in your company, but it requires greater certification, your baseline is whatever job plus degree/skills/certification that you currently hold. You end goal is the certification that you need and the position you desire. It is very easy to measure if you have achieved the goal. Even though the metric isn’t a number, like a weight loss goal, it is a yes/no measurement. Keep in mind that this goal has an element that requires another person to bring it to fruition. A promotion can’t be acquired without the person in charge of hiring. Though by preparing yourself for the position, you put yourself in a place that your options are improved, so the goal remains a good goal. So you want to be royalty? For the most part, all royalty positions are filled in the world. Sure maybe you can get into some lesser royal family on some remote planet somewhere, but realistically, you can’t just use positive thinking and your incredible powers of manifestation to make this one happen. So, while I really want you to dream big, let’s frame this goal around achievable possibilities that you do not have to count on someone else to deliver for you. You with me? Additionally, think of goals as sub-dreams, little pieces that will all come together to round out your grander vision for life. If, for instance, in your 10-year vision, you want to be superintendent of large urban school district, but you were just hired in as a first year teacher with a bachelor’s degree in a medium-sized suburban district, you have a number of attainable goals before you to achieve on your way to your vision such as joining and chairing school leadership teams and earning an advanced degree in educational leadership and administration. Start with the attainable goals that are sitting within your immediate reach. Whatever you do, don’t let fear of failure scare you off. There is no failure. Everything you gain throughout the process is yours to keep forever. Your vision might change as your goals are met and you gain greater perspective on your desires and skills. Embrace all that you have reaped and set new attainable goals from your present perspective. When considering the relevance of a goal, it is absolutely vital to line it up with your personal “Why!” Why? If your goal is misaligned to your personal values and vision for life, it has no enduring umph to carry you through the challenging times. If you want to make a boatload of money for the sake of being a billionaire but your personal values suggest that you really take great responsibility in coaching your daughter’s soccer team, you probably aren’t going to choose activities that align with making big bank over spending that time with your family, thus your goal lacks relevance. Other factors include whether this is the right time. Your goal alignment might be true to your values and vision, but the time might not be right. This is a particularly important point as you learn to balance intuition with logic. Intuitively you understand your direction, but sometimes that pull is so strong that you may jump before the timing is aligned if you don’t call in your logical brain. When we are in a flow state, our logical brain works in tandem with intuition instead of overriding it. Do you know your “Why”? Reserve your complimentary coaching consultation now and align to your life’s direction! If you have ever procrastinated about ANYTHING, you know how important placing an end date on a goal is. You might have even waited until you weren’t actually sure you could achieve the task before the due date (or so I’ve heard….) 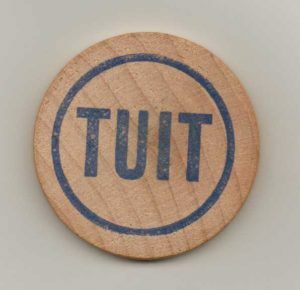 Without a deadline, your goal will be nothing more than a “round-tuit’, especially if you are the only one holding you accountable. It is relegated to one of those great ideas that never happen because you prioritized it to something you would get around to doing “someday” (like my personal wish to learn to play my guitar – At this point it is a wish rather than a goal because I have hotter pans over the fire). Not only is it important to set a due date to achieve your goal, it is vital to plan the various timeframes for the goals within goal. What will you do today? By next week? Two months from now? For example, if you plan on remodeling your kitchen, when do you reasonably plan to finish your project? Is there an event requires its completion (those are the best at forcing your hand!) While establishing your ultimate time frame is necessary, it isn’t sufficient to assure the jobs completion. You will need to order cabinets or other fixtures by a certain date to receive them in time for that phase of the project. Finally, think about the little things that need to be done today or tomorrow, whether that is setting money aside or making a call to the plumber for an estimate. Goal setting is the key to personal and professional growth. 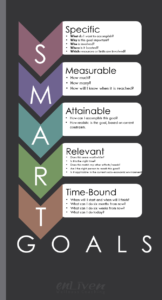 The acronym SMART is the framework described above, providing clarity, commitment and motivation. The best use of this framework is for shorter-term goals rather than long range goals, or vision. Vision is more visceral. It is something that you visualize and feel without knowing the complete roadmap. The further out a vision is from the current moment, the more loosely it must be held to allow for changes in perspective as you grow and change. Using the SMART framework long-term actually limits the possibilities of how ultimate goal could be realized because it becomes harder to see opportunities that are outside of “the plan”. On the other hand, short-term goals that are immediately implementable need the structure that the SMART framework provides to give you the impetus that you need to take the steps that move you in the direction of your and in alignment with your your personal values. Take the Personal Values Assessment now! If you are done putting off until tomorrow all that you should have done yesterday, last week, or last year, and you understand the value of having a enLiven Wellness Life Coaching as your personal growth accountability partner, reserve your complimentary coaching consultation now. Todd Smith, a former school psychologist, is founder and director of enLīven Wellness Life Coaching, Toledo’s premier personal growth practice. It is Todd’s mission to create a world in which people stop chasing dreams and start making their biggest aspirations actually live and breathe by stepping into their boldest challenges and committing to a life of incredible personal growth. In his “spare time”, Todd is most often spending his hours with his three talented and athletic kids at ballet, track, gymnastics, soccer, and other various activities or playing a sport himself. Todd helps clients set and achieve their biggest personal development goals by understanding their core values and crafting a vision that will guide their daily choices and actions.